Northern Okinawa is absolutely stunning. The biggest city in this region is Nago City, which is a city with all the city-life perks (malls, chain restaurants, convenience stores, Don Quijote…) plus a stunning view of the ocean and mountains. Aside from Nago City, the northern part of Okinawa is largely composed of small towns and villages. In short, it is very countryside. 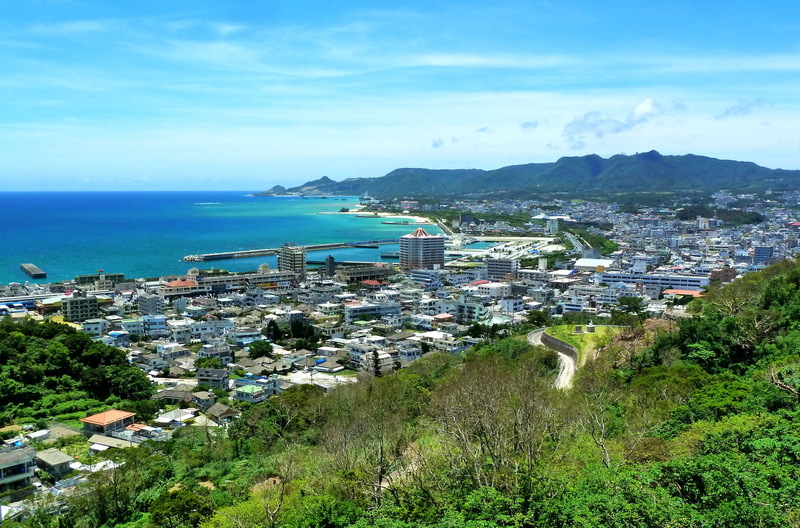 However, the beauty of northern Okinawa is a key tourist spot, so there are many foreigners sightseeing in the area—particularly along the beach side and near the resorts or around the famous Churaumi Aquarium or overlooking the vast ocean on the capes and cliffs. Regardless of whether you’re near Nago City or in the countryside villages, the Okinawa JETs living in the area are a close community—kind, supportive, and fun. There’s so much to do and see in the area, and the locals are kind and welcoming here. This mountain has a great view of Yagaji Bay, Motobu, Ogimi Village, and Higashi Village. At the top is a hotel with a restaurant and coffee shop, and obervation decks. There are also cabins for camping. This waterfall is gorgeous (see the picture above!). However, is is all wild and there are no sidewalks. The river rocks are slippery, so good protective footwear that you don’t mind getting wet is a good idea. The falls are definitely worth the trek, but be careful! This is a great waterfall with a path that leads up to it. It takes around 1 hour to reach the waterfall from the starting area. It’s a fun hike! You need to pay for parking and entrance (about ¥300), but from there you can walk up the path up to the waterfall and swim. The falls are open from 9 AM–5 PM. The waterfall is stunning! This is a great hike! It’s all in the wilderness and at the top, there are ladders to climb above the trees and check out the view. It takes a few hours to do this hike, but it is a great way to see the wilderness of Okinawa. This entire area is protected as a wildlife area, so you may see birds, turtles, snakes, and bugs among the trees. Please read HERE for information about snakes, they are not commonly encountered by people but common in the wild. This hike is generally safe, but please be cautious and pay attention to the signs and to the path. This is a highly recommended activity for those who enjoy being in nature! Cape Hedo has an amazing view (picture above). It’s also a wonderful place for eating, surfing, rock climbing, and just chilling. This is the farthest northern point on Okinawa hontō. On a clear day, you can see Yoron Island to the north, which is the southern-most island of Kagoshima Prefecture (you can take a ferry to Yoron from Motobu Port). Uza Hama Beach is nearby and you can walk along the shore or surf during high tide. You can also dive here, but it is best for advanced divers only. The current can be very strong and it is possible to be pinned in underwater tunnels due to rip currents. Please dive only when the sea is calm—during the summer when the winds come from the south and the wave action is low. ※ If caught in a rip current, RELAX. The rip is formed by a channel of water moving back out to sea (like a river—it is not the width of the whole ocean). Since it is narrow, you can swim out of it. Don’t try to swim straight in to shore—you’ll fight the current and tire yourself out. Set a course perpendicular to the current, swimming parallel to or 45 degrees to the beach. You will then be able to clear the river-like rip current and get back to shore. This is a really small shop that specializes in bagels. You can get bagel sandwiches here or bagels with different types of spreads. Everything is really good here! It’s open from 11 AM–7 PM and closed on Wednesdays and the fourth Thursday of each month. Parking is extremely limited here, but you can park nearby and walk over. The burgers here are amazing. This burger restaurant is located along the beach and gets crowded quickly. If you go during peak hours, you may have to wait to be seated (sometimes the wait is more than an hour). But the burgers here are delicious! This small café has lunch and dinner set meals, and Okinawa soba. It’s open every day from 11 AM–2:30 PM (lunch) and 5:30 PM–10 PM (dinner), and closed on Tuesdays and every fourth Saturday of the month. Get your ramen fix here! You can also have fried gyoza and other side dishes here. There’s a lot of options and it can get very busy at this restaurant. Its open every day from 11 AM–2AM. You can get your late night fixes here! This is a yakiniku restaurant. You can try a variety of meat here and cook it on a grill at your table. It’s open every day from 5 PM–11PM and closed on Tuesdays. This café is a vegan café in Nago City. They only use plant-based ingredients in their dishes. They also don’t use MSG, food additives, GMO products, refined sugar, and frozen foods in their dishes. It’s open from 11 AM–4 PM and closed every Monday and Tuesday. There are many small towns and villages in the northern area. You can explore these places and find wonderful restaurants and nature sites (such as gardens that have certain flowers blooming during each season). There are also festivals that are worth checking out! For instance, Ogimi Villiage has a festival every summer with the most amazing fireworks display in the entire prefecture!